Doctors Nikki Gorman, Jenn Gruen and Robin Abramowicz have helped thousands of babies grow up healthy and strong. But when it comes to swans, all they can do is watch. Fortunately, they’ve got a great vantage point. Village Pediatrics‘ office is on Riverside Avenue. Nearby — on the banks of the Saugatuck River — a swan built a large nest. The doctors were fascinated. So were their patients. Many headed to the adjacent boardwalk, for a closer look. The pediatricians set up a video cam, with a live feed. Kids and their parents monitored the progress of the eggs — and then the birth of a few cygnets. The Saugatuck River swan, with 3 cygnets. On Tuesday, Jennifer Seymour, her husband and their sons ate dinner at Rive Bistro. Suddenly, the swan family paddled by. But the Semours’ excitement turned to sadness when they saw only one cygnet trailing the 2 adults swans. There were several more cygnets earlier that day. 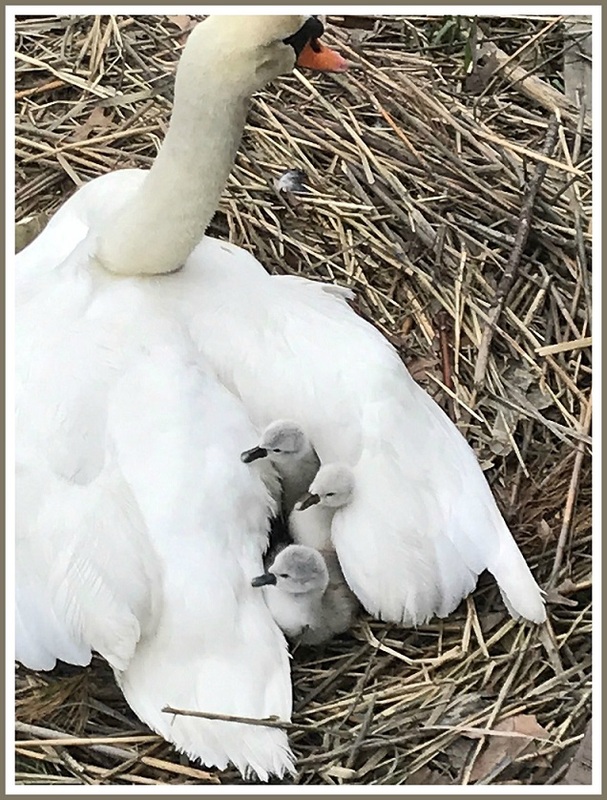 This entry was posted in Children, Environment, Saugatuck and tagged cygnets, Dr. Jenn Gruen, Dr. Niiki Gorman, Saugatuck River, Village Pediatrics. Bookmark the permalink. It’s that time of year- we have a bunny nest in our lawn…. Bunnies abound on our property too this time of year (Trumbull). No swans though … no water nearby, heh. Enjoyed this tidbit today, Dan.